Wouldn’t you like to find an extra hour to your day and not lose any sleep to do it? I think I have found a way to accomplish this! You are not going to believe this! Recently it was brought to my attention that on an average; people spend 55 minutes each day looking for lost items! Just think about what you have looked for today. I have been asking folks all day about what they have been searching for. Some of the answers were typical: flipflops, shoes, socks, the remote, bills, keys, sunglasses, glasses, phone, birth certificate and the most popular “My Mind”! If the truth be told, whenever you lose anything your mind is the first thing to go! The stress and guilt of losing something again causes us to not think logically. I wish we had an acronym to help us FIND things. I may not have that acronym but I do have a plan! Let’s go back in time and stop ourselves from losing things in the first place. My grandmother always said, “Everything has a place and everything in its place!” Just think about how this little saying can put an extra hour in our day! Oh but we can’t do that! We are not behind! Let’s jump in where we are! If we took the time to pick up after ourselves instead of stashing things like a crazy person then we may actually be able to find those items when we need them. But the problem is that we don’t have a place picked out for that item. The reason we don’t have a place is because clutter has taking over all of our storage areas and flat surfaces. We buy houses with lots of closets, kitchen cabinets and drawers yet each one is filled to capacity with miscellaneous items. There is no true organization to our homes because we can’t seem to get rid of our clutter. In order to find a place for everything we have to begin the process of decluttering. We do this with 2 minute Hot Spot Fire Drill, 27 Fling Boogies, and 5 Minute Room Rescues. These are fun ways to reduce our clutter. We can also set our timers for 15 minutes and sort through those cluttered recesses, one drawer or one shelf at a time. Sort the clutter into three bins: Give away, put away, and throw away! I know that in your “Want it now” mentality that you are determined to get your house organized as fast as you can. The problem with this is that you will crash and burn! When we take babysteps to release the clutter and use our zones to work our way around our homes; we can determine places for the things we love and use. As you eliminate the clutter, you are going to find that you have several like items. One time we got a testimonial that said she found seven pairs of scissors in her home as she declutter. We know how that happens. When we can’t find a pair of scissors we go out and buy another pair. Isn’t it funny that we spend more time buying a new pair than searching for the old one. Once the clutter is gone you can determine a place for everything and with more time on your hands you can put things back where they belong! 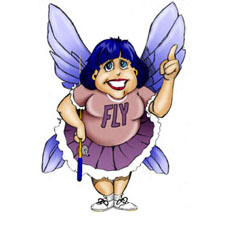 For more help getting rid of your CHAOS, check out Marla Cilley’s website at www.FlyLady.net, her book, Sink Reflections, published by Random House, and her New York Times Best Selling book, Body Clutter, published by Simon and Schuster. Copyright 2012 Marla Cilley Used by permission in this publication.